If you are a professional working in adoption, student or a perspective adoptive parent or grandparent, aunty, uncle or friend of adopters, This book is for you! 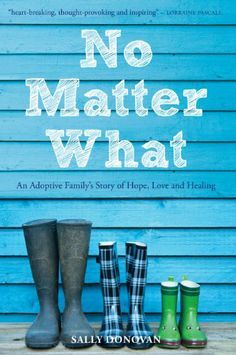 ‘No Matter What – An adoptive family’s story of hope, love and healing’ by Sally Donovan. Life is not always plain sailing once they have adopted their two children but Sally shares the joys and the despairs in equal measure as her new family is slowly woven together. As a social work student interested in the areas of fostering and adoption, this book gave me a whole new perspective on adoptive parents and the struggles they face hand in hand with their children. I can recommend to anyone interested in this area. I can’t guarantee there wont be tears, but I can guarantee you will learn something from this book. I have put a link to the author Sally Donovan’s website below if you would like to read more about her. Hi I thought you might be interested in this oral history interview on working with adoption in the last century, a historical perspective.